A recent World Bank report on gender-based violence in Kerala, the state known for its best social indicators across India, has shockingly found that there is a much higher underreporting of incidence of sexual violence among Hindus compared to the state's two other major religious groups – Muslim and Christian. As against the average of 9 per cent underreporting across all religions, the report finds, the underreporting is 10 per cent among Hindu, but 8 per cent each for Muslims and Christians. In a further breakup, the research team led by George Joseph, a senior economist with the World Bank, says that among Hindu females, the underreporting is to the tune of 13 per cent, as against 10 per cent among Muslim females and 9 per cent among Christian females. An alternative to the method of direct questioning, under list randomization, respondents are given a set of true-false statements that are both relevant and inoffensive to the respondents’ socio-economic or political context to ascertain their attitude towards a particular issue. However, the researchers find that a whopping19 per cent Hindus females report domestic violence as against 12 per cent males under the list randomization method. 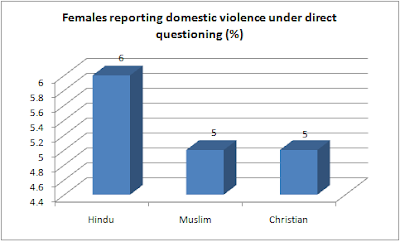 Under direct questioning, 6 per cent Hindu females and 6 per cent Hindu males report sexual violence. Among the Muslims females, under the list randomization method, 13 per cent report domestic violence, as against 11 per cent males. As for direct questioning, it is 5 per cent for Muslim females and 6 per cent for Muslim males. 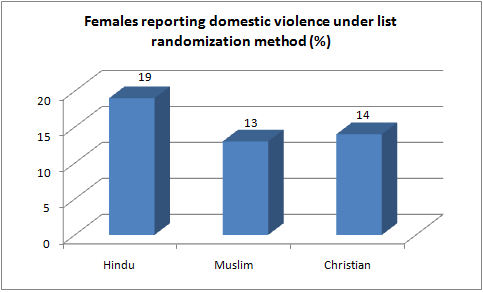 And as for Christians, 14 per cent females reported domestic violence under list randomization method, as against 11 per cent males, though under direct questioning, it was five per cent for both males and females. The researchers quote the National Family Health Survey of India (2005-06) to point out that the percentage of ever-married women, who have experienced physical violence at the hands of their husbands in Kerala, is 15.3 percent, compared to 35.1 percent for India as a whole. “In particular, both women and men with professional degrees have the highest rate of underreporting, with men having at least a marginally higher rate of underreporting than women in this category”, it adds.